It’s getting to that point in the semester when you’ll be getting more and more work piled on to you, and/or you have to catch up on everything you’ve been procrastinating on. We’ve certainly been through it, and isn’t easy. 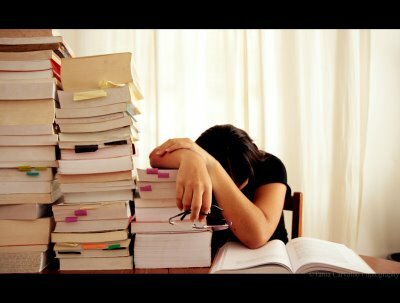 However, there are some things you can do to get through this crunch time in the semester. Make a to-do list. Writing down a list of things you need to get done by the end of the day, the end of the week, and/or the end of the month can be really helpful. It not only helps you to organize your thoughts, but it will also help you to remember everything. It’s really easy to forget when you have a lot of stuff on your plate. Writing everything down like this, in an organized list, can also help you to de-stress, because you may just realize that you really don’t have that much more to do. Prioritize. This is probably the most important you can do to get through this time in the semester. You may even want to prioritize your to-do lists and make yourself a note of the things that you should get done first and what things can wait. Take small breaks. It’s a good idea to take small breaks in between working, as it can help you keep focused and give you time to collect your thoughts while you do your work. Maybe you want to work for 30 minutes, and then take a 5-minute break. Or, maybe you want to work for an hour and take a 10-minute break. It’s completely up to you. We know that it’s coming to be a difficult time in the semester when you’ve got a lot of stuff going on. However, it’s important to make sure that you get through this time so you can finish off the semester on a good note. By making a to-do list, prioritizing, and taking small breaks in between your work, you can help ensure that you successfully make it through this crunch time in the semester. 1. Get good at time management. Who doesn’t procrastinate? However, it can hurt you when it comes down to finals and writing ten-page papers. The best thing to do is create smaller deadlines for yourself. This means that if you have a huge paper due next Friday, maybe you want to plan out when you’ll have your research done by, when you’ll have the outline done, when you’ll have your draft, and when you want to be officially done. It sounds a little strange but by setting these smaller deadlines, it will help you get to the bigger one. 2. Get good at organization. In high school you may have been able to get away with turning in your homework one day late. However, in college, this isn’t the case. You want to make sure that you keep track of your assignments and their due dates. Double check before you leave your dorm or apartment in the morning that you have all your assignments that you’ll need for your classes. Also be sure to keep at least your desk neat so you can find your assignments easily. 3. Find the right place to study. You study spot should be a place where you can get the most work done. That could be your room, the library or another spot like the coffee shop. You just need to make sure that spot works for you. Think about a time when you’ve been most productive: Was the place where you were working quiet? Were there a lot of other people around? Maybe you don’t do well in complete silence or you do well with a lot of other people around. You want to figure out what study environment is best for you. 4. Watch your finances. One of the biggest problems students can encounter when they go off to college is running out of money. Running out of money doesn’t only mean that you won’t be able to go out to eat with your friends or go see that movie you’ve been dying to see, but that may also mean that you won’t have money for things like textbooks. You want to be sure that you’re managing your finances and avoiding overspending. 5. Make sure you have a good alarm clock. While a phone alarm may be the most convenient, it may not always work. Suppose the battery runs out while you’re sleeping and you sleep through your midterm. Be sure to get an alarm clock that is loud enough to wake you up, and one that is reliable. 6. Pay attention in class. Seems pretty obvious, but is actually one of the things students seem to forget the most. Class time is the most important time to be paying attention; this is the time that you’ll get important information related to the material or the assignments. Be sure you pay attention to what your professors are saying. 7. Take notes in class. Maybe another of students’ biggest problems is not taking notes. Like paying attention in class, it just seems obvious. It doesn’t matter if your professor posts PowerPoint slides up online after class, you still want to make sure you take notes as they lecture as they will often not include things on their PowerPoint just to test to make sure you are paying attention and taking notes. 8. Participate in class. In most classes you will be graded on how often you participate, meaning either added to a class discussion or contributing an opinion or question. It doesn’t matter if you’re shy; your professor will still grade you on whether you are participating or not. Make sure that you contribute in class, and that you’re making informed and intelligent contributions (professors can tell by your comments if you haven’t read the material). 9. Find a friend in each class who you can study with. It’s really nice to have a study buddy who can help you out when you don’t understand something, help you if you forgot something, or give you notes when you’ve missed class. You can do the same for them, and by doing this, it will actually help you to understand the material better too! 10. Avoid cramming. While sometimes it’s a necessity, it’s best to avoid cramming before a quiz or exam. Plan out a study schedule ahead of time so you can take breaks and you don’t feel to overwhelmed. In most cases, studying over a longer period of time and more frequently will help you do better. As we mentioned in our post yesterday, college is meant to be one of the greatest times in your life. You shouldn’t forget to have fun. However, you should be sure to develop some strong skills and habits that will help you make it through to graduation.